On the heels of MoMa’s fashion exhibition “Items: Is Fashion Modern?” I’ve been thinking a lot about what constitutes, ‘modern’. I touched upon it in my recent article about Fashion Group International’s Night of Stars: “Modern Voices”, but I wanted to expound further. 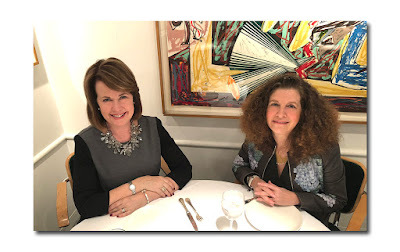 As previously noted, the word modern is constantly bantered around, especially within the world of fashion, and there are probably as many ways to define it as there are those to try to do so. It’s hard to disagree with many of the ‘items’ in the aforementioned exhibition (the oxford cloth button down shirt, the white t shirt, the black turtleneck, blue jeans, the little black dress, the puffer jacket, le smoking, the biker jacket, the trench, etc.) 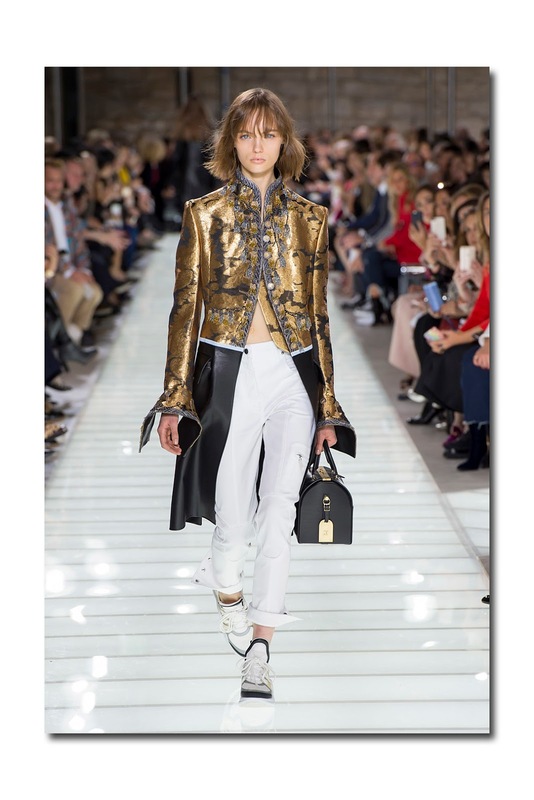 though I would probably add white jeans, the Courreges vinyl jacket, and gold hoop earrings to that list. And I would also add Sade, the 58 year old Nigerian singing legend whose bold gold hoops have become part of her identity. The iconic image of her, wearing a well-worn denim shirt, high waist jeans, bold gold hoops, hair pulled back in a chic braid, and red lipstick, is etched in my memory. It may be decades old, but everything about it is thoroughly modern. 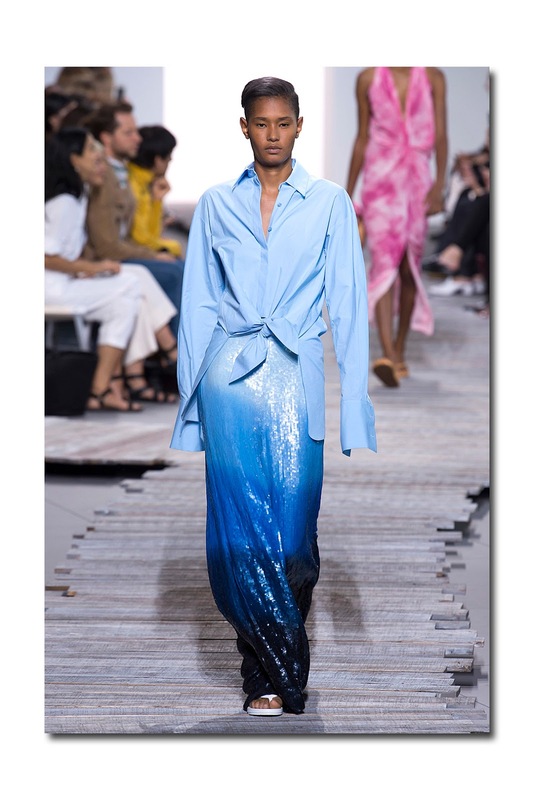 It’s hardly surprising that she has served as inspiration for many designers, including Celine’s Phoebe Philo and Rachel Comey who invited her to her spring/summer 2017 held at the Met Breuer (she politely declined). But for me, it’s not just about specific ‘items’ as much as it is about the way things are mixed, combined, moved around, and put together. I am a true believer than you can make anything look modern if you know what to do with it. We’ve just come off a month long of shows and endless designs being put forth, and there’s so much noise and hype. But in the end, after all is said and done, there are certain things that for me, truly stand out. 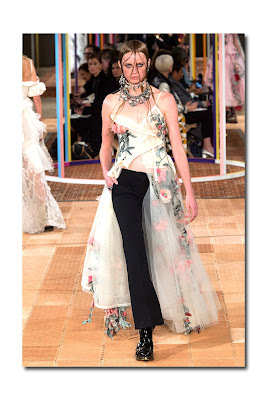 The notion of modern may well be elusive and hard to put your finger on, but as they say, you know it when you see it, and the following images represent some of those things (all from spring 2018 ready-to-wear collections, courtesy vogue.com unless otherwise noted). It’s all about counter intuitive, odd couple pairings: hard and soft, masculine and feminine, high and low, delicate and hard edged, sheer and opaque, street and couture, old and new. 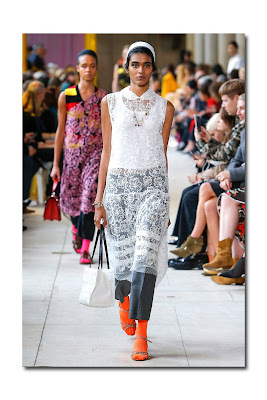 All of which were in abundance at the Burberry September Show. It was a thoroughly modern eclectic mix of aristocratic and street; the definition of English eccentric but global to the core. Coincidentally, it was just announced that Christopher Bailey, president and chief creative officer for the past 17 years, (and the person who has been elemental in the transformation of Britain’s oldest and largest luxury brand), would step down at the end of 2018 to pursue “new creative projects”. At Alexander McQueen, Sara Burton downplayed the soft, delicate, and pretty through the use of statement making edgy jewelry and buckled gleaming black patent biker boots. In one instance, she paired a sheer flower strewn corseted tulle dress with black trousers to perfectly offset the look. Nicolas Ghesquière offhandedly combined luxurious decorative 18th frock coats with decidedly sportier zippered roll cuff pants and grounded them with trainers. FYI, it’s all about sporty, athletic, comfort and ease these days. For me, one of the best things to have happened in fashion in the last few years, is the acceptance of flat/low heeled shoes (they are a viable alternative to high heels) and the elevation of the lowly sneaker. Nothing is more modern than being able to stride purposefully, or make a run for it if you have to. It’s the epitome of modern and it never gets old as the combinations are endless, and they all work! (I think I dream in black and white). 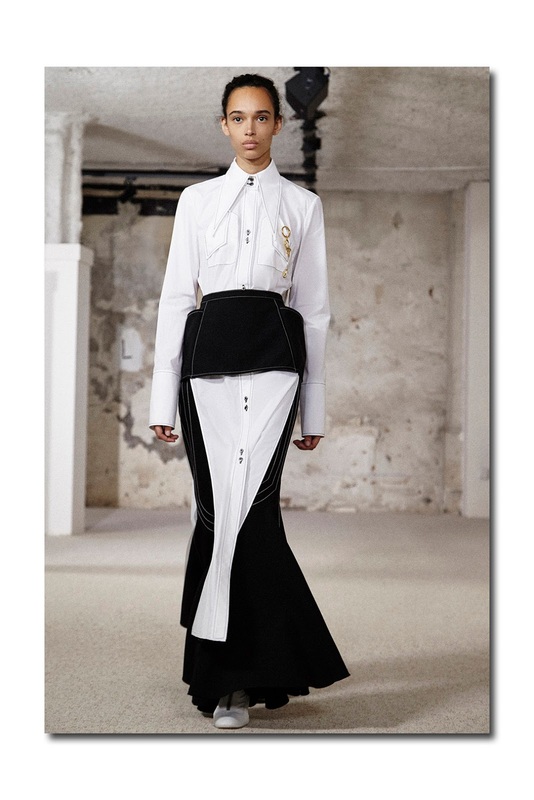 Kym Ellery’s modern take on the classic and always perfect combination of a white shirt and black skirt, giving it an unexpected French twist, was thoroughly modern. At Miu Miu, Miuccia Prada proved that you can make sheer lace and transparent slips unprovocative and appropriate for day (and the street) if you layer them inventively. 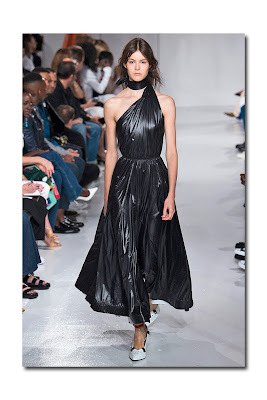 The always risk taking Raf Simons brilliantly used waterproof nylon, plastic, and rubber to create couture like silhouettes for Calvin Klein Collection. 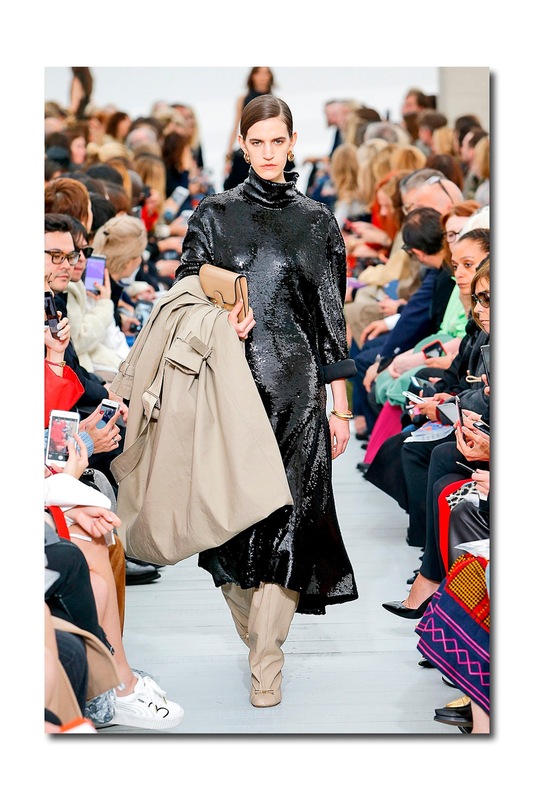 I love the way Celine’s Phoebe Philo took an otherwise glamorous black sequined dress, tossed a tan trench coat over it, and put chino trousers beneath it, all of which completely threw it off. 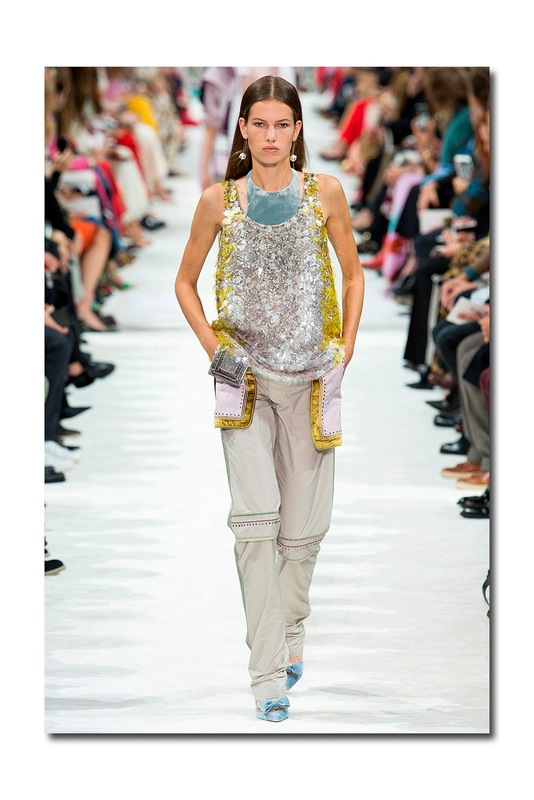 There’s nothing basic about Valentino’s tank tops, utilitarian parkas and cargo pants luxuriously reworked in silk and sequins. 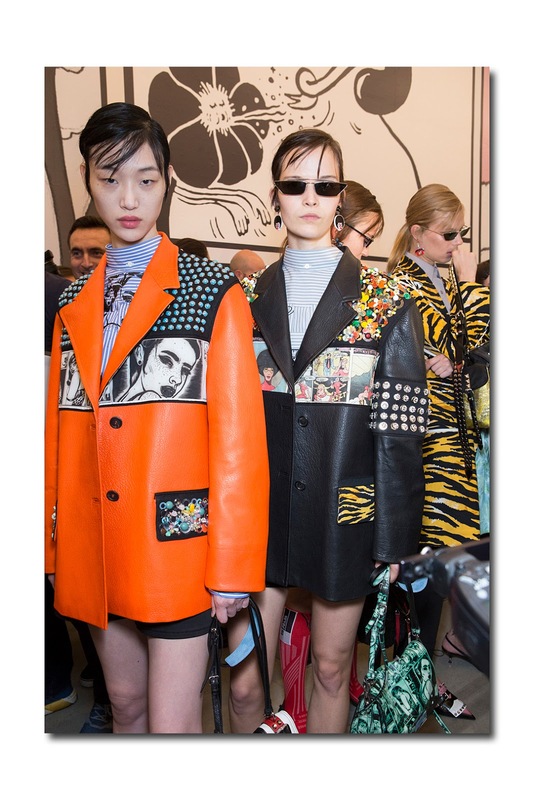 Miuccia Prada may have used the work of contemporary manga artists and women cartoonists as a jumping off point for her Prada spring 2018 collection, but her strong militant feminist message, was no joke (and could not be more relevant at this particular moment in time I might add). Who said evening even has to mean a traditional gown, cocktail dress, tuxedo? 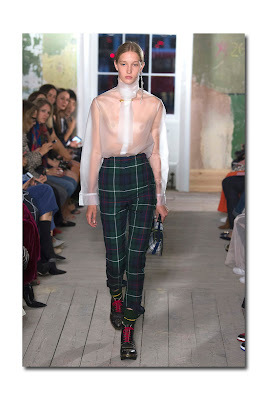 Instead of overthinking and going for something fussy and "ungapatchka" (Yiddish for overly ornate, busy, ridiculously over-decorated, and garnished to the point of distaste), why not try an oxford button down man’s shirt with ultra-long cuffs, worn with an ombre sequined floor length skirt and flat sandals such as the one Michael Kors presented? Long gone is that ridiculous rule about not wearing white shoes after Labor Day. In fact, white footwear is the height of chic anytime of the year, day or evening. They go with every color and there is no quicker way to punctuate all black, than by simply adding a white shoe or boot. The whole perception of beauty has changed and it’s become far more democratic, realistic and more inclusive. 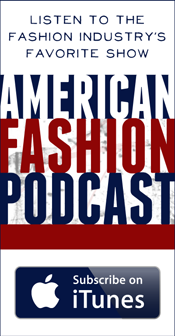 It’s no longer a cookie cutter, unattainable ideal and encompasses all sizes, ages, genders. 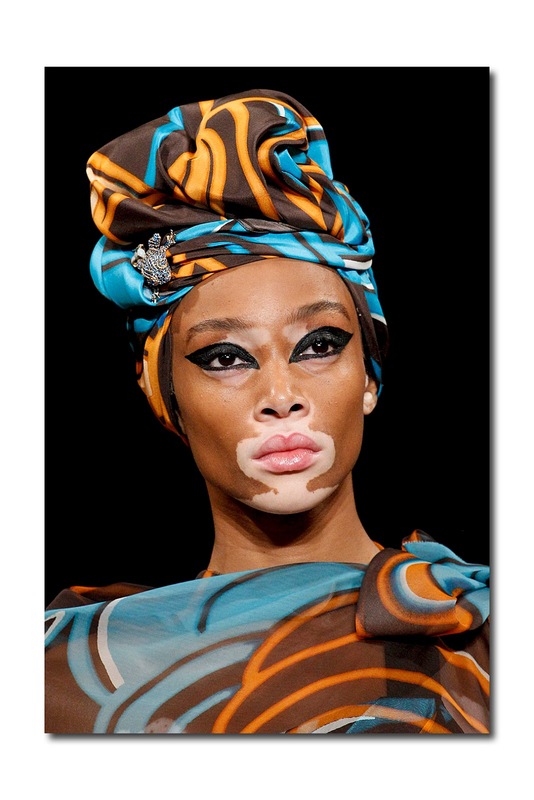 It is not surprising that Winnie Harlow, despite the fact the she suffers from the skin disorder vitiligo, has become a runway star. Nothing is more modern or easier than affecting a daily uniform predicated on distinctive wardrobe staples in black, which, after seeing a riot of color on recent runways, has never looked better. You can’t go wrong with J. Brand’s The Nerd short sleeved t shirt in black and their Selena cropped flared leg jeans in shiny stretch patent. 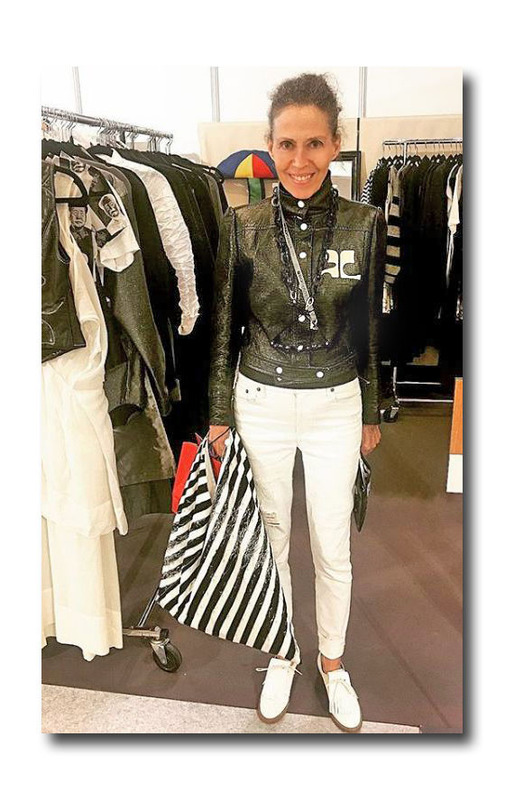 Labels: In the Market Report by Marilyn Kirschner: What is Modern?